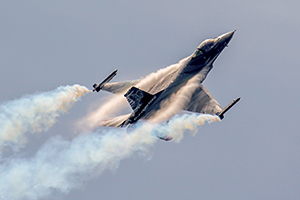 As seven Red BAE Systems Hawks conduct their final manoeuvre, the ‘Vixen Break’ the crowds applauded, left breathless after an incredible full display by the RAF’s official display team at the RAF’s only official air show. A few eager members of the 60,000 strong contingent noticed the synchro-pair returning for an encore, before they draw a giant ‘100’ in the sky underlined by a final flypast from the rest of the World famous Red Arrows. Leaving everyone present in no doubt; Sunday 10th June 2018, RAF Cosford was the place to be. 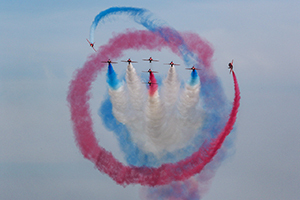 Prior to the annual event, the 2018 Cosford Air Show had been billed as ‘the most spectacular and interactive air show tribute to the Royal Air Force’s centenary’. The show did not disappoint. 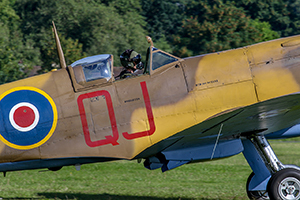 On the ground were a plethora of stalls, exhibits and activities, most notably an unrivalled collection of over 100 static aircraft. 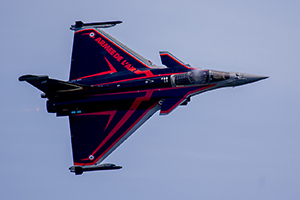 Each of which had been selected due to its significant link with the Royal Air Force. Meticulous planning had gone in to ensure that none of the RAF’s 100 years had been forgotten in this unique celebration. The static aircraft on display had been flown in or transported by road from all corners of the UK. RAF Cosford is still home to the No.1 School of Technical Training, the Aerosystems Engineering & Management Training School and the No. 1 Radio School. But today a walk across the airfield was like a walk through time. At the far end visitors could see the early airplanes such as the Royal Aircraft Factory’s BE2 which were in service when Hugh Trenchard formed the Royal Air Force in 1918. A little further down the site the silver biplanes of the 1930’s were represented by the Hawker Nimrod and Gloster Gladiator. 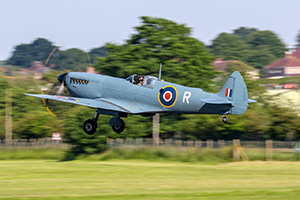 The 2nd World War was far from forgotten with Hurricanes, Spitfire’s and the World’s only surviving Boulton Paul Defiant which had been wheeled out from the neighbouring RAF museum for a rare day out in the sun. 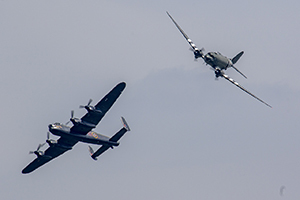 The static exhibits were also brought to life with carefully placed reenactors who helped pay tribute to significant RAF moments such as the Berlin airlift (with a little help from a Douglas Dakota). 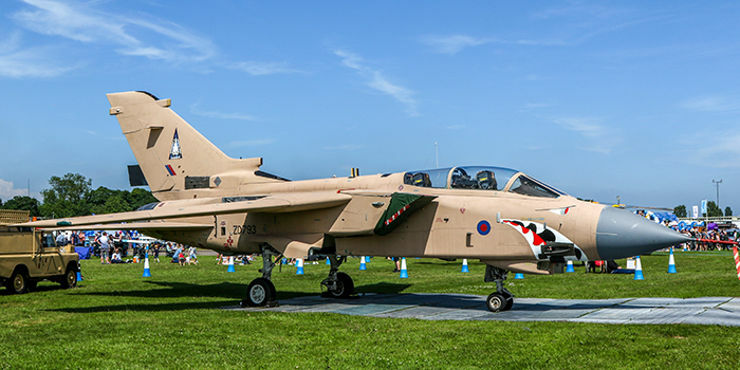 One of the highlights of the static show was undoubtedly the vast collection of historic jets including an Operation Granby tribute in the form of Buccaneer, Tornado and Jaguar wearing desert pink. Unsurprisingly, the famous ‘Black Mike’ McDonnell-Douglas Phantom attracted a lot of attention. Parking the record breaking Phantom next to The English Electric Lightning, Gloster Meteor, Hawker Hunter and Parnavia Tornado was an aviation photographers dream. Sadly, this was a one-day only event, leaving limited time to enjoy all that was on offer. The incredible static park was more than matched by a stellar line-up in the air. The RAF Falcons kicked off the display as is tradition at Cosford. 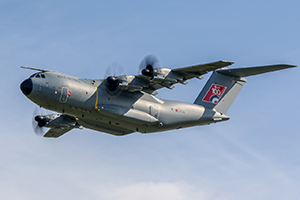 The Royal Air Force Parachute Display Team were able to perform a full height jump out of their Dornier 228 into the glorious blue Shropshire sky. The RAF100 flag was proudly flown ahead of the famous Falcons Stack. Another well-thought out plan by the organizers saw a predominantly chronological theme to the days flying. The Great War Team sent their Avro 504, SE5A and BE2C to kick off the historic section. 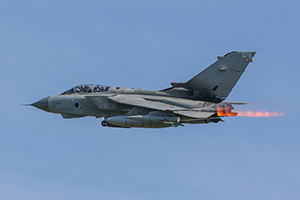 The RAF has always been keen to acknowledge support from other Nations throughout its history so todays RAF100 flying display was punctuated with fast jet displays from Belgian, France and Poland. The later sending a Mig-29 Fulcrum, briefly forming up with a Hawker Hurricane as a poignant tribute to the Polish air-men who fought for the RAF during the Battle of Britain. The rotary section of the RAF was not neglected; there were displays from the Flying Bulls Bolkow BO-105 and Bristol Sycamore, which attracted considerable attention on its UK post-restoration debut. The Gazelle Squadron display team reminding us of the types manoeuvrability and the much loved Whirlwind put in a nostalgic tribute to the Search & Rescue element of the RAF. 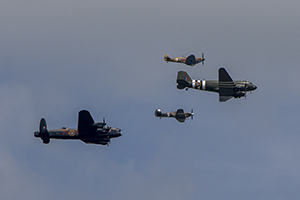 Other flying display highlights included the awesome Battle of Britain Memorial Flight who today paid their own tribute to the RAF’s founder in their ‘Trenchard’ formation of Lancaster, Dakota, Hurricane and Spitfire, catching all by surprise with a crow-rear entrance to start a dynamic, crowd-pleasing display. The Royal New Zealand Air Force also made the considerable trip to take part in today’s flying with the surprisingly agile Boeing 757. 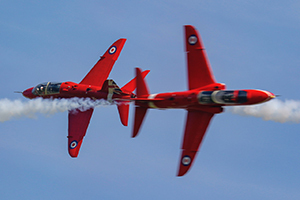 The perfect weather conditions allowed the Red Arrows to let-rip with a full aerobatic display, marking the beginning of the final segment of the flying display where the Shropshire crowd would see the Modern Royal Air Force in all its glory. 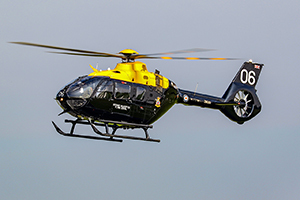 The new Juno and Jupiter helicopters conducted a few flypasts heralding the beginning of the next 100 years. Not to be outdone, Flt Lt Stu Kynaston reminded us that the aging Chinook still has life in it with a gravity defying display. The RAF’s flight training was well-represented by the Tutor, Prefect Tucano and Hawk T2. 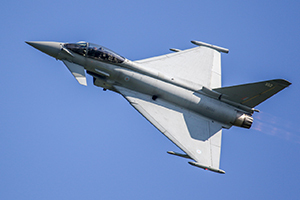 After flypasts from the soon to be retired Tornado GR4 and mighty Atlas A400M it was left to Flight Lieutenant Jim Peterson and his Eurofighter Typhoon to close the show with an incredible display of the UK’s airpower. 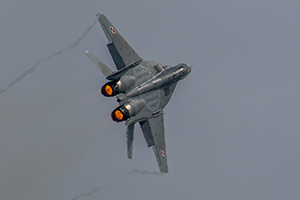 The noise and vibrations were felt by all as the multi-role jet was put through its paces. A fitting end to an incredible day, this truly was the most spectacular tribute to the Royal Air Forces Centenary. 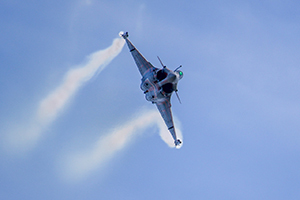 RAF Cosford Air Show will return on Sunday 9th June 2019, be sure to put this date in your diary.